Edward Dee was born and raised in San Francisco during the conscious-raising 60s. As a teenager, Ed was already recognized as an up-and-coming songwriter and musician by SF Chronicle entertainment critic, John Wasserman, and performers the likes of Country Joe McDonald, who performed one of Ed’s songs on tour. Ed’s musical career began at age 14 on, of all places, the Lincoln Park golf course, where he was caddying for a prominent SF building contractor. After the round, this man asked Ed if he wanted to take his earnings and bet them on a horse at Bay Meadows Race Track. Ed being a minor, the gentleman placed the bet for Ed… and the horse paid off!! Asked what he wanted to do with the winning, Ed wanted to buy a guitar! So they went to a hock shop on Mission and 5th Street where Ed bought his first guitar. At 15, he played his first gig ever with older musicians who took Ed under their wing and schooled him in the San Francisco music style and scene. The musical artists that have influenced the development of Ed’s own unique style are… Paul Simon, James Taylor, Paul McCartney, Sting, Carlos Santana, Stephen Stills, Eric Clapton, Jerry Garcia, Country Joe McDonald, and Garth Webber. 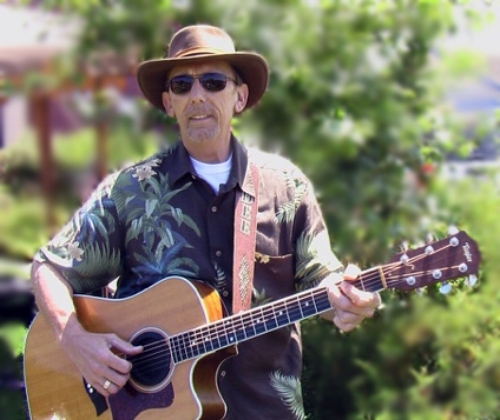 Edward Dee is an acclaimed performing artist, singer/songwriter, guitar man in Corvallis, Oregon and in the San Francisco Bay Area with over 60 original songs in his repertoire and 3 professionally-produced CDs - The Sound of Pretend, That Side of the Street, and Choices. His CDs feature some of the best musicians in the San Francisco Bay Area. The current project for Edward Dee is his band, EdDee’s Friends. The band is made up of various seasoned accomplished musicians who sit in with Ed. The music is an engaging blend of indie original songs plus favorite blues, pop and classic covers. The guitar is king with this band with great rhythms and superb guitar solos, both acoustic and electric. Check out EdDee’s Friends on their YouTube Channel. Ed has and continues to perform in and around Corvallis, Oregon and, at times, in the SF Bay Area -- as a solo singer/songwriter… on guitar and vocals with Corvallis-based band, River Rocks… as the other half of a duo with accomplished marimba player and percussionist, Julia Harrell (http:/juliaharrell.com/)… in a duo with Bay Area bass player and vocalist, Geoff Allen… as the lead guitar player and vocalist with the American retro rock-and-roll band, Blue… also periodic work in Las Vegas and Los Angeles. Edward Dee is also a guitar instructor with over 25 years of experience teaching students of all ages. After graduating from high school, Ed taught guitar to high school students for 5 years in the San Francisco Unified School District. He co-created a songwriting class with Country Joe McDonald, and develop a concert-promoting course funded by the legendary promoter, Bill Graham. Currently, Ed teaches guitar in his home studio with students from in and around the Corvallis/Albany area and surrounding communities. Until it’s closing in 2017, Ed was the master guitar instructor at the Lesson Loft at Gracewinds Music in downtown Corvallis. Ed can also teach any interested student on Skype, Zoom or other live video platform. Ed’s students play at all levels - from brand new beginners to accomplished players who are ready and determined to take their playing to the next level. Get to know Edward Dee and his music!